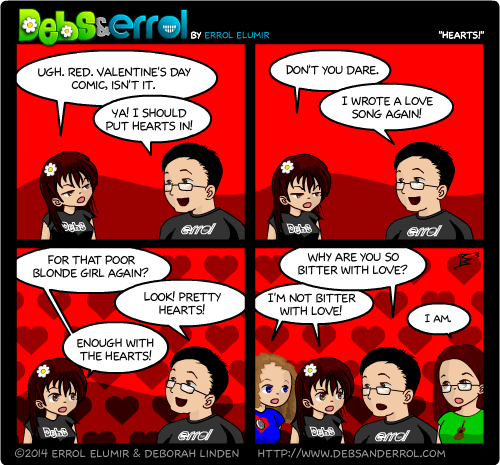 Errol: Continuing the theme of getting everyone mad at me, here’s today’s Valentine’s Day comic. Debs: Ew…hearts. Gross. 😛 I have chocolate. Manpans: Good gravy, this man and his love talk. Honest, it’s barf inducing. On a positive note, HAPPY VALENTINE’S! Spend it with people you lurve, whether it be your significant other or your friends! Also! I wrote an article on my favourite non-romantic couples! You should check it out and tell me yours in the comments! Kari: Duuuuuuuuude. Happy Half-Price Chocolate Day, everyone. I don’t know what all this wuv stuff is doing here. S.A.D – Socially Awkward Day? Singles Awareness Day. XD Though I think I like Sauron Appreciation Day better lol. Have you ever tried dating when you’re just a disembodied eye? Sauron had it tough. And don’t get me started on the trouble he had when his last relationship fell apart and he tried to get his ring back. Ah, “Singles Awareness Day”…yet another excuse to regard single people as sad, lonely, bitter, unfulfilled losers who deserve an acronym like “S.A.D.” Do excuse me while I go punch whoever came up with this “progressive” acronym in the face. I prefer to celebrate Half-Price Chocolate Eve, though Sauron Appreciation Day sounds fun too. That acronym is very disheartening. Haha. heart. I vote we change from Singles Awareness Day to Singleness Appreciation and Mutual Cameraderie Day, and to hell with catchy acronyms. E: So, Sauron, how’s it goin’? E: Not much to say. I get it. A little depressed? E: Here, let me read you some Terraria fan fiction!! Honestly you’ve failed to appreciate Sauron’s method of operation and available resources- that last one should have cut to the arrival of a Ringwraith or an army of orcs. Oh, I enjoy the minimalist approach. Very pythonesque. oh look, it’s Princess Debs with a crazed smile and a evil gleam in her eyes..she’s in a dump truck…aww isn’t that nice, she has all that dirt for Errol…..odd, she isn’t stopped….why is there a cement truck backing up?…do we run now?? our Beloved Princess Debs is annoyed, who shall we sacrifice to make her happy again? the guy who foolishly gave us a red background…the better not to see the bloodstains. All of this bitterness can be cured by playing the Partridge Family’s “I Think I Love You” sixty or seventy times. lemme guess…headache after the first several times followed by blood smears as you smash your head to get away from that sound…followed by the blessed blackness of being knocked out from blood loss? Well, yeah. Sure. We’ll go with that. I love you people. 😛 You are amusing. Kari, around here half price candy day is tomorrow. T.T And it’s too cold to walk to the store anyway. Yes, I realise, Lore. That’s why I called it “Half-Price Chocolate EVE.” It’s like Christmas Eve, only for half-price chocolate.